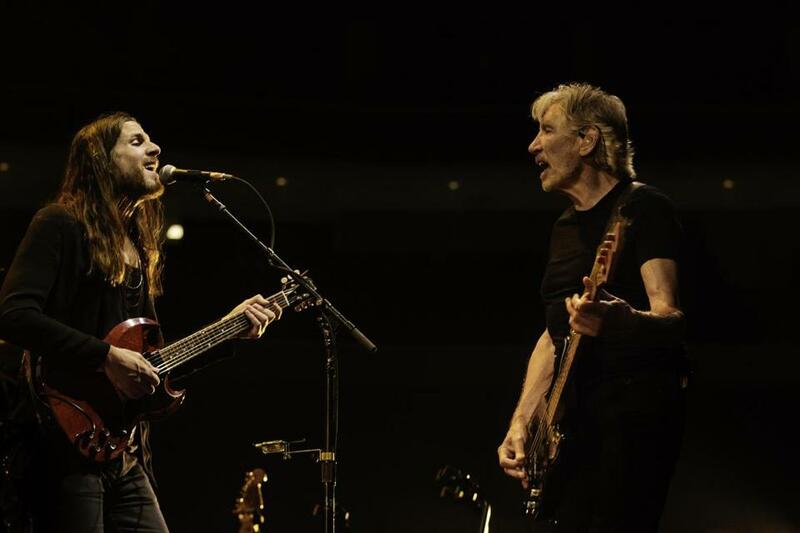 Jonathan Wilson (left) plays guitar in Roger Waters’s band and on his new album. The most special effect of the new Roger Waters tour isn’t the airborne pig, the 1,000 watts of prismatic lasers, or the wall of video screens that bifurcates the arena. It’s the onstage arrival of band member Jonathan Wilson. The bearded musician with waterfall hair on either side of his center part resembles a young David Gilmour, Waters’s erstwhile partner in Pink Floyd. Also uncanny? Wilson’s ability to emulate Gilmour’s vocal and guitar parts. But that’s not the sole reason Waters hired him to round out his band. “Roger calls me his ‘obligatory hippie,’ ” Wilson says via phone during a break in the “Us + Them” tour, which arrives at the TD Garden Wednesday and Thursday. Wilson’s retro aura goes beyond his penchant for beaded necklaces and green army jackets, or the way he often ends sentences with “yeah, man.” The 42-year-old’s most recent solo album, 2013’s “Fanfare,” plays like a psychedelic folk-rock classic from 1971. That ability to conjure up golden-era sounds has made him one of Los Angeles’ most sought-after session players and producers. Wilson recently co-produced Father John Misty’s hit album “Pure Comedy,” worked on yet-to-be-released songs with Lana Del Rey, and played on Waters’s “Is This the Life We Really Want?” Collaborators seem drawn to the Bohemian musician for his communal sensibility. Wilson first traveled to California at age 19 to find his bliss. It didn’t come easy. After the dissolution of Muscadine, the mid-1990s grunge band he formed with Benji Hughes, Wilson declared a self-imposed strike from the music industry. Then in his 30s, he set up a luthier workshop and made guitars for members of Aerosmith, Cheap Trick, and Maroon 5. The instruments quickly became wall-mounted trophies for collectors. “I ended up getting frustrated. ‘I shouldn’t be making guitars for people who can’t play guitar like I can play guitar. So maybe I should get back into it,’ ” Wilson recalls. His first step: Curating weekly jam sessions at the Laurel Canyon home he’d decorated with tie-dye tapestries. On Wednesday nights, there’d be a haze above the house that wasn’t from the LA smog. “It was centered around a house band that would continuously show up. Then it extended to everyone from Jakob Dylan to Elvis Costello to Jenny Lewis, who lived down the street. It became definitely the place to be,” he says. As a result, Wilson amassed what might be called a “squad” long before Taylor Swift made it a thing. The songwriter called upon famous brothers-in-amps such as Chris Robinson of the Black Crowes, Jackson Browne, David Crosby, and Graham Nash to guest on his albums, “Gentle Spirit” (2011) and “Fanfare,” plus the “Pity Trials and Tomorrow’s Child” EP (2012). Wilson is particularly proud of this year’s “Pure Comedy,” the third album he’s co-produced for his best friend, Joshua Tillman (aka Father John Misty). Waters also completed his latest record, featuring Wilson on guitar, at the studio. “That was very surreal, to have him in my kitchen every day,” the lifelong Pink Floyd fan says. The consequent invitation to join Waters’s band made it challenging for Wilson to finish up his next solo album. (“It’s a different kind of vibration. It’s maximalist — that’s all I’ll say.”) But touring with Waters fulfills Wilson’s ongoing quest for a community spirit in music.